Clearing forests for logging, mining, or agriculture poses a direct threat to ape populations. But the indirect threats of habitat degradation and fragmentation may be the greater danger. Road-building gives access to remote forest areas, creating consequences that extend far beyond the industrial footprint. The largest danger comes from hunting—including subsistence hunting by local inhabitants and labor crews, live-animal capture for the pet and exhibition trade, and commercial bushmeat hunting for sale. In Sumatra and Borneo, logged forests have been replanted as palm-oil plantations, resulting in the killing of thousands of orangutans because of their (perceived) impact on crops. In addition, as habitat shrinks, population density may increase in the remaining forest, forcing groups of apes into greater contact with each other and with humans, potentially resulting in confrontation and the spread of pathogens. Tuberculosis, polio, influenza, and herpes are among the diseases that spread from humans to other primates. Ebola is suspected of killing as many as 30 percent of the world’s gorillas, in addition to thousands of people. Unchecked, current levels of wildlife mortality can lead to an “empty forest syndrome” of land devoid of medium- and large-bodied fauna. And, because apes are crucial disseminators of fruit-tree seeds, among others, their loss can change the composition of the forest, making it permanently less desirable as wildlife or human habitat. A number of approaches have been suggested to minimize the impact of industrial development. Translocation of orangutans from fragmented forest patches to relatively untouched areas has been tried, but is a partial solution at best. Even if suitable habitat is identified, the process stresses the apes, and the introduced apes may exceed the carrying capacity of their new territory or come into conflict with preexisting populations. In the exploration phase of mineral or hydrocarbon mining, transporting workers and equipment by helicopter minimizes the need to build roads. 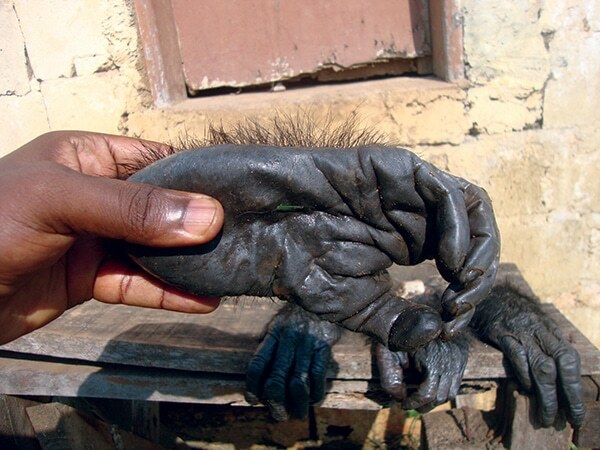 Industry provision of adequate, affordable supplies of alternate sources of protein can reduce the demand for bushmeat. But many challenges remain, including the costs of these remedies and the weakness of national and local governments in many ape-range countries. Industries can be held accountable for the direct impacts of their operations, but there is no obvious way to apportion responsibility for the indirect effects that spread beyond the concession boundaries. However, without strategies to reduce or mitigate these indirect impacts, the survival of wild ape populations will remain at serious risk.